I’m not very successful at Twitter. I tweet under my character, Virgil Creech and mostly get ignored. But recently, one of Virgil’s best tweets was, “Boys will be boys, unless they can be pirates. Then, they’re always pirates.” It got a lot of likes and some retweets. It is fun to assume the personality of a raucous twelve year-old boy who doesn’t quite understand stuff going on around him. I might be 46, but I often don’t get stuff, either. Like on on this foggy morning. It is one minute and thirty three seconds of fast-paced music. Better yet, the boy in me can pretend I am a pirate fighting alongside Jack Sparrow and Will Turner. I don’t always brandish my sword and scream as a run along the beaches with my mates. Not always. But, like I said, today was a tough run. So to the two women who came around the blind corner today when I was racing to battle, I am deeply sorry I scared you. I was not after your booty as you might have feared, I was only charging to fight Davy Jones. After all, I’m a pirate. Every boy should become a pirate, not the nasty kind that plunders ships, but the kind who sets his eyes on all the possibilities of an open horizon. 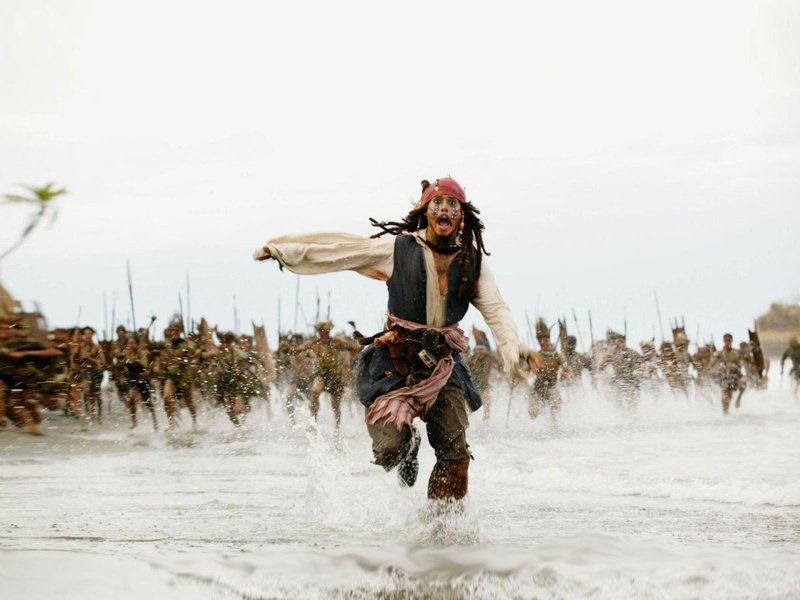 Every runner should be a pirate too. One who understand that the road is a place for play and possibilities not a distance to be covered. Amen and well-said. A little plunder isn’t a bad thing, though. Hehe! I remember when my brother and I turned our bunk-bed into a pirate ship and raided the cookie jar. Plunder is wonderful until you have to sleep on the crumbs. Haha! I love memories like that. I don’t get twitter…seems like outrageous spam to me. But I have never opened an account to try to learn it either. Fear it being more time consuming. Like anything, it’s all in what you put into it. I have fun, but refuse to just spam my book, that seems disingenuous. So I absolutely agree with you on that point. I try to observe life from a boy’s eyes. Sometimes it resonates with people, other times it is a vast wasteland. You never know. Fun post. I tweeted it from two accounts. I like twitter. Thank you! I dont dislike Twitter, I just haven’t figured out how to use it. I understand about the running. Gotta have something to keep you moving! Ha ha, there be tweeting pirates everywhere, me hearty, even out here in space. Though between you and me, I get my rascally wretch of a writer to do my stinky pirate tweets for me…. It’s time for tweeting – I tell her – or walking the plank, and she’s out in that twittersphere quicker than you can say “Bloodthirsty Blackbeard the Bad is a stinky old space pirate”. She never was much good with heights 😉 In fact, if I ever did running I’d probably get her to do that for me too…! We need to run the gauntlet sometime together and show the land-lubbers a thing or two! Awesome post. I’m ashamed to admit I love to run to Veggie tales, “pirates that don’t do anything”. I have two boys, and have witnessed, and participated in many a sword battle. Some were epic, but none required an eye patch after, thankfully. I’m looking your pirate song, and your word. I love veggie tales! My favorite is King George and the Ducky. I might have to add that pirates one to my playlist. Thank you! Fun! I want to be a pirate, too! But, I don’t want to run! Can I come along and yet sit on my bum? I like my rowing machine. I can help row the little dingy to shore. I’m good with maps, too. I can point and tell the other pirates where to dig. You can row beside us if I can shout, “Row! Ye scurvy dogs,”All piratey every now and then. Ok, I’ll let you call me a scurvy dog, Captain! Strange little fact. Every time the phone rings and I look down to see my husbands name, I answer the phone: “Ellow Poppit” in a very pirate sounding voice. I think he’s gotten used to it! I share your ‘not being successful-ness’ of twitter. I also understand the ‘tough to get going’ at running sometimes. Well, maybe we twitter losers can enjoy each other’s tweets! I am always optimistic that this is the one…but I get nothing. Oh well, they make me smile.